Bachmann's HO Scale 14 Piece HO Scale E-Z Track Plastic Pier Electric Train Track Accessory. Retail $34.00 SAVE 37% ! "Piers work well once they are assembled"
Fast and easy assembly and trouble-free set up. This pier set is compatable with most other popular track with roadbed systems. 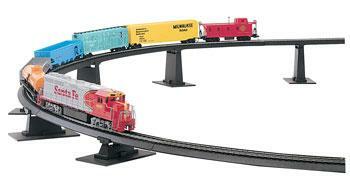 With this pier set, you can create an over/under figure 8 track. Pivoting track bracket for best support of track incline. Removable design for floor or carpet set up. These black plastic piers may be nailed to your railroad layout for permanent installation. "Great tool for measuring and testing grades"
this set makes creating and testing grades very easy, but the set up, while still easy to do, isn&apos;t as quick and easy as described. each pier has 3 pieces, that fit very snug so assembly is a little tougher than anticipated but not hard. they were great for large or small grades, but don&apos;t put them too far apart or too close together, both have their flaws when you actually run the train. And make sure to adequately plan your grade! while these are great for getting up to a good height, you can&apos;t just put the whole pier set in place and expect it to make the pull upwards if they aren&apos;t spread over a good enough distance. For example, going from a flat level to the highest pier takes a vast range to successfully make the pull upward when there are multiple cars on your train. And I built one of my flat cars myself, and (this was my first hand made car) it was too heavy to make the pull upward in a shorter distance. So, very much a rookie mistake, but these piers can easily help you find a potential problem and a resolution, it just takes a little time and patience adjusting the piers where they need to go. All in all, it&apos;s great for getting your grades set up and tested.